This stunning typewriter was introduced by the Polyphon-Musikwerke in 1903. 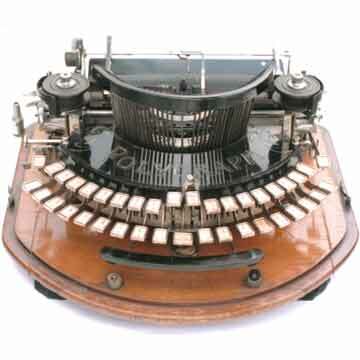 The first model with the straight keyboard appeared in 1903. It was a well built and beautiful machine but it was not a commercial success. Production ended in 1909. An attempt to revive the machine was made in 1919, but again without success. As a result, the Polygraph is now an extremely rare machine. The Polygraph was advertised as the most simple typebar typewriter of its day. It was a strange claim for a machine that was well built and actually had some special qualities. The curved model printed a total of no less than 102 characters, including all accents and special characters used with the Latin alphabet. The machine also had a special typebar, with a small wheel in it, that could be used to underline entire lines. By pushing the bar onto the paper and releasing the carriage, the line was drawn using ink from the ribbon. See also the book TYPEWRITER, page 173.